We said our farewells to Lithuania and greeted the next unfamiliar Baltic country, Latvia. 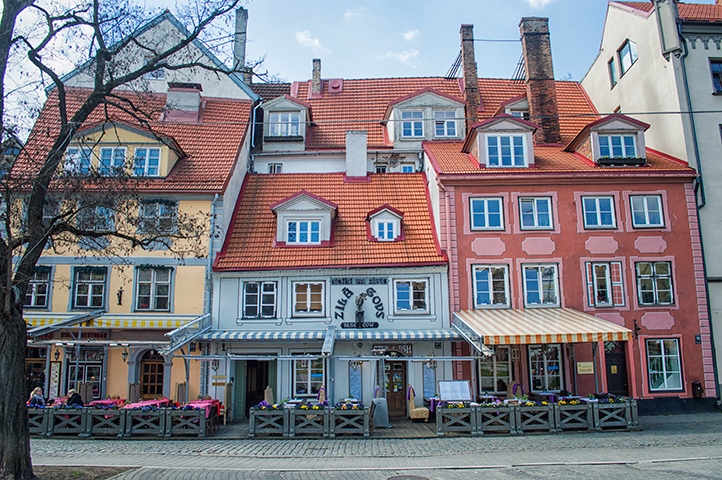 Known as one of the most beautiful countries in the World, it’s rightfully been referred to as the pearl of the Baltic States. Now having learned this, you’ll undoubtedly ask yourself, why Latvia? The great thing about visiting these Baltic countries at this point in our trip is that it’s different from Western Europe. There are a plethora of cathedrals and buildings similar in each country that it starts to blend. 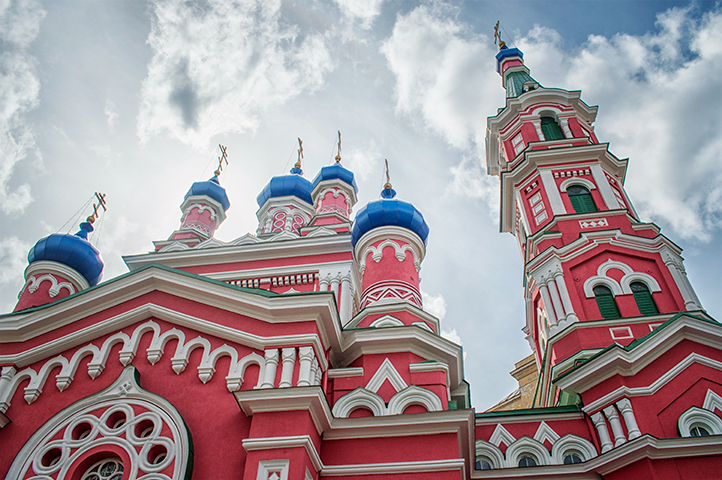 The churches, food and languages in the Baltic’s had the Russian influence to them. It was a nice change of pace in it’s capital city Riga. When we first arrived in Riga it was still raining as if the clouds had hopped on the bus with us back in Lithuania. For the first day or two we hung out in our shared space. After a little cabin fever from being cooped up we headed out. We were staying at an AirBnB right on the Daugava River. There were cafes nearby, stores and a scenic walking path. Me and Melissa walked the paths in the rain talking while Pablo worked in the apartment. 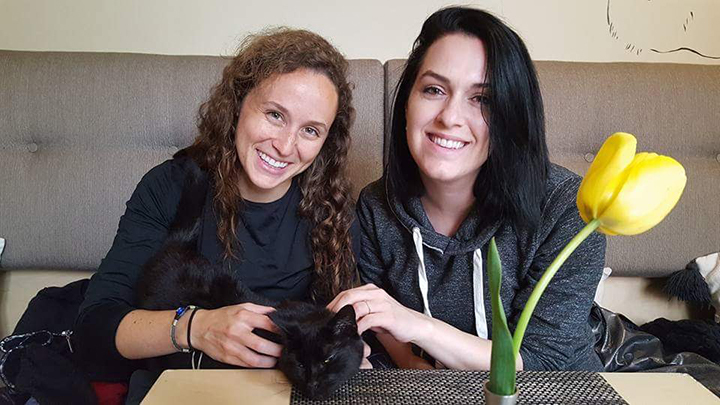 If you’re an animal lover you would love the cafes that were by our AirBnB. One of the sandwich cafes had a couple dogs snoozing in the corner, and this was normal for several places. We ate at one particular cafe called MINKA Cat Cafe. Don’t worry, they don’t serve cat, they just have cats roaming everywhere while you’re eating. I was curious after we ordered our food and the cats slumbering above my ahead started to stir if I would have to compete with them for my food when it came. Fortunately they were only slightly curious, but then sat on our laps or moved on to the next customer as we ate. With the rain pelting the window, the calm atmosphere in the cafe and the cuddly cats I wanted to take a cat nap! One of the things I reminisce on from Europe is walking through the old cobble stone streets. I usually get lost in the imagination of what it was like in it’s prime. How fascinating would it be to travel back in time to when these older structures were built? I’m guessing most people wouldn’t want to, but what if you could just for a day? A lot of renovation is done to repair the damages to these Old Towns. So much so it’s hard to find the actual Old in Town. However, if you walk the streets looking for nothing in particular you’ll go back in time. Finally the rain stopped and the skies cleared. It was finally looking like Spring! We took the bus and walked all over Old Town (sorry Old Town)! First, stopping at the House of the Blackheads and leaving without acne. Then skipping past Freedom Monument and quieting down in St. Peter’s Church. Coming across yet another Cat House – Man these guys love cats! 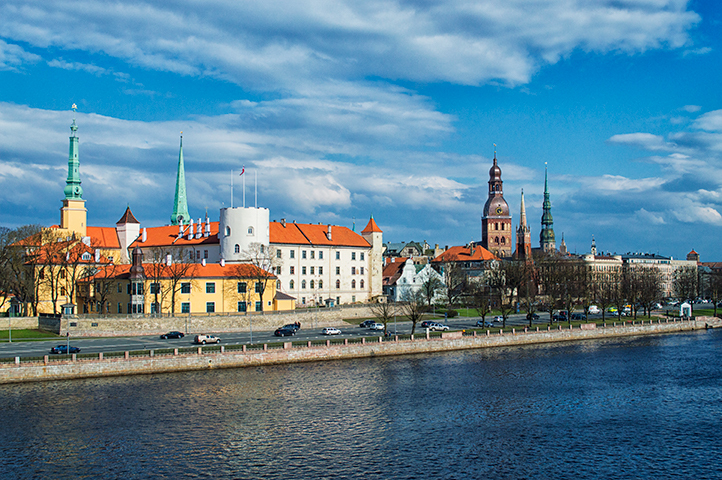 Looking on at the Riga Castle from the vanšu bridge and freshening up at the Powder Tower. We were ready for lunch by the end of it all. We ate at a buffet called Lido that served local Latvian food for a great cost. I wish every country we’d visited had a buffet so we could sample everything to our hearts content. 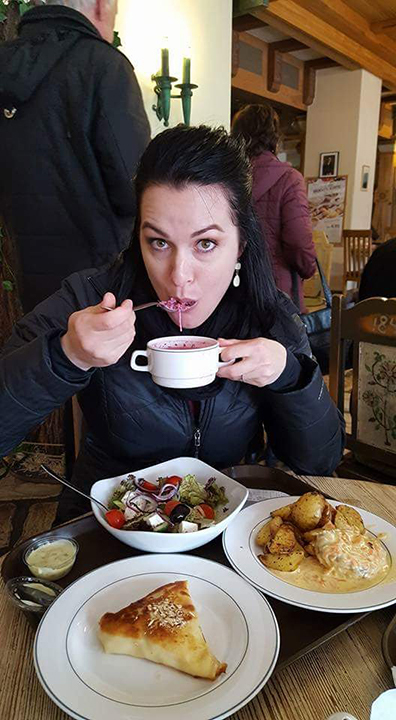 The food was amazing, all except for the beet soup. First off, soup shouldn’t be cold. Secondly, why beet soup?! Melissa loved it, so I guess to each their own. For us, Latvia and the other Baltic countries held mysterious expectations. It’s not a destination a lot of tourists go to, and for that reason we wanted to. 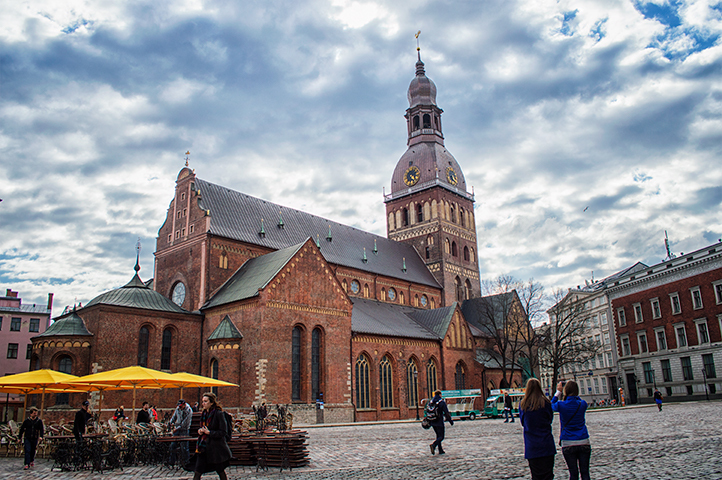 Overall Latvia was decently priced for accommodations, food, and flights. It’s not crowded with tourists so you have the opportunity to enjoy it like a local. 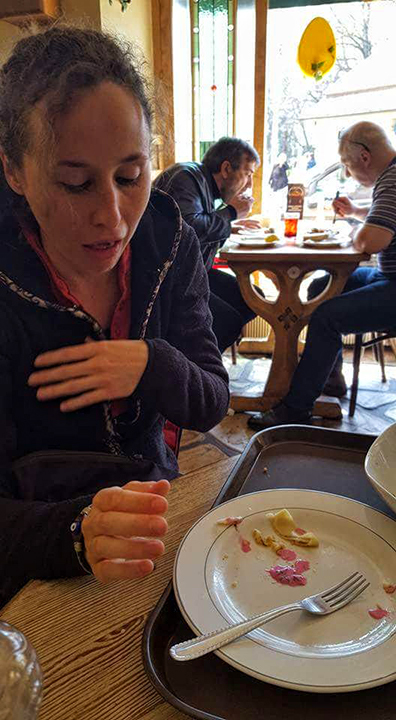 It’s easy to find traditional food, and have an authentic European experience. Latvia is a pearl but it doesn’t just sit on the seashore, you have to dive for it. Where have you been that you consider it to be a pearl? Next story What Makes Estonia Unique? Previous story Do you know Lithuania?